Gold/Silver Ratio 2015: Can Silver Rise When Gold Falls? SILVER looks cheap right now, and not only because it has dropped 70% in Dollar terms over the last three-and-half years, writes Adrian Ash at BullionVault. That, says Yahoo Finance, is the view of smaller private investors, apparently "wedded to [the] idea that the Fed is going to destroy the Dollar" even as QE ends and rate-hikes are next. But a growing number of professional analysts also say silver is cheap, and very cheap compared to gold. Cheap enough to make buying it over the heavier metal – or even "ratio trading" the precious pair, shorting gold and going long silver – an attractive play. The core idea is that the long history of gold and silver as monetary metals still lingers, and their prices still track each other very closely today. So first up, UK consultancy Capital Economics. The drop in both precious metals is overdone, they think, but the Gold/Silver Ratio is really out of whack. Because as both metals have sunk in price, silver has fallen too fast, sending the relative value of gold to 5-year highs near 75 ounces of silver per 1 ounce of gold. What Capital Economics calls the more "normal" ratio of 60 would, on flat gold prices, take silver back up to $20 per ounce by end-2015 as gold rallies to $1200 on their forecast. Because silver is primarily an industrial metal, it could then rise again to $23 in 2016 on "any economic recovery". But gold, being relatively useless to industry while loved by consumers and investors, is seen trading shy of $1400 two years from now. Trouble is, that "normal" level of 60 is an average of only the last 20 years. 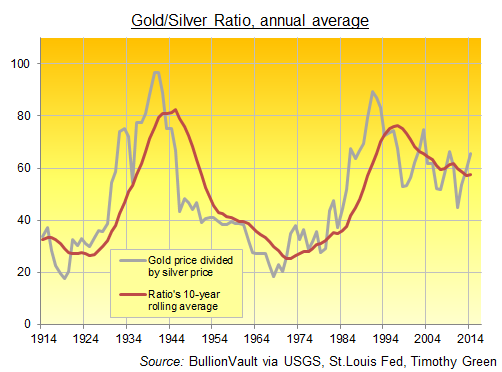 Longer-term averages in the Gold/Silver Ratio are lower – much lower. So either silver is deeply undervalued against gold today, or the underlying trend in the Gold/Silver Ratio points higher because the world is choosing to price gold more highly over time. Physically, the earth's crust contains perhaps 20 times as much silver as gold. Global mine output last year was at a ratio of 8-to-1. But at market prices, here's how the Gold/Silver Ratio has moved in the last 100 years. Further back, and starting from around 10 ounces of silver per 1 ounce of gold in early medieval Venice, the Gold/Silver Ratio was set around 15.2-to-1 by Sir Isaac Newton when he established what then became the Sterling Gold Standard at the start of the 1700s. A century later, the young United States ran a "bimetallic" standard at 15.5-to-1, but after the Gold Standard went global, and pushed silver out of the world's monetary system, the heavier metal's relative value rose again in the early 20th century, peaking around 100 during the Great Depression. Gold prices were fixed at $35 per ounce after WWII, with private ownership and trading banned to maintain that peg. But monetary inflation rose sharply, inviting higher prices in freely traded silver, and driving a slump in the Gold/Silver Ratio below 20 until gold was de-linked from the US Dollar – and shot higher – during the 1970s. Over the next 40 years, the Gold/Silver Ratio repeated that surge and fall. It has averaged 60 over the last two years. To push back to that level in 2015, silver could gain 12% in Dollar terms, even with gold holding flat near today's four-and-half-year lows of $1150 per ounce. Starting from today's 5-year low in silver's relative value to gold, it's not only Capital Economics who think the cheaper metal could "potentially outperform gold by a very large margin." Investment bank J.P.Morgan just revised its gold and silver forecasts for 2015. Its new forecasts put the average Gold/Silver Ratio back down at 66 from today's 74 level. Dutch bank ABN Amro meanwhile urges investors not to buy gold – calling it a "falling knife" – but also says silver prices will recover. The table at the end of this note shows that ABN expects silver to rise in nominal Dollar terms next year, recovering to $18 per ounce by the end of 2015. With gold prices down at $800 per ounce, that would squash gold's relative value from 75 to 44 ounces of the white metal. But really? That's some forecast. The 44 level has only been seen in the Gold/Silver Ratio four times in the last three decades, and only when silver prices have reached a marked peak. And could silver rise so sharply when gold prices fall? The post-WWII restrictions on gold trading began to unravel in 1968. Since then, and looking at all 12-month periods, gold and silver have moved in the same direction some 75% of the time. Gold rose while silver fell 17% of the time, but silver rose as gold fell only 7% of the time – and almost half of those times came during Warren Buffett's concerted silver purchases (some might say "corner") of the late 1990s. Berkshire Hathaway came to own 130 million ounces, then equal to around one-sixth of the world's entire annual silver mining output. That wasn't quite as much as Texas oil barons the Hunt brothers tried to corner in the late 1970s, but for silver to end its current slump and turn higher, one leading analyst has said it would need an uber-rich "sponsor" again. So history says silver can go up as gold falls. But such an event is rare. If silver is to rise 50% by end-2016, as Capital Economics' two-year forecast of $23 per ounce suggests, then the historical record says it's highly likely gold will have risen too. Out of all trading days since 1970, silver has stood 50% higher or more from two years earlier some 22% of the time (London Fix data). Gold has always been higher as well. Always. And where silver has stood 45-55% higher from two years before (roughly 1 day in 30 over the last 11,270) then gold has always been higher as well, gaining 40% on average. So, silver up but gold down? For a while perhaps. But through 2015 and on to end-2016...? Don't bet on it.